Our guest contributor this week is Pat Barch, the Hoffman Estates Historian. This column originally appeared in the July 2017 issue of the Hoffman Estates Citizen, the village’s newsletter. The column appears here, courtesy of the Village of Hoffman Estates. Moving to a home out in farm country was exciting back in 1965. With 2 young children, my husband and I bought the perfect home with a large yard for a little baseball, playing croquet and room for a swimming pool. Shopping, bowling and a movie theater just within walking distance made for happy parents and kids. We seemed to have everything we needed except for a nearby doctor and hospital. With a new baby in the house, the long trip to the city to see the family doctor was inconvenient especially since I was just learning how to drive. It didn’t take long to find a local doctor in Elk Grove Village. The kids played outside the better part of day and we seemed to keep him busy with broken bones, stitches and miscellaneous bumps & bruises. 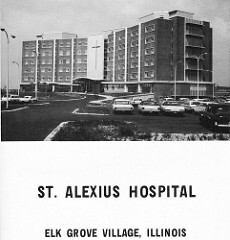 We had to take the kids to St. Alexius Hospital in Elk Grove Village on Biesterfield Rd that had just opened in the summer of 1966. It was a long ride when you had a kid bleeding or screaming in pain. It took a few trips to the hospital before I learned the route. Northwest Community Hospital in Arlington Heights had opened in December of 1959 but it was no closer and our doctor was not on staff there. We survived those early years without our own hospital. We now had 4 kids and kept the emergency room busy with all the mishaps that came from falling out of trees to falling out of bunk beds. It was a wonderful day when American Medicorp built the Community Hospital of Hoffman Estates. The doors opened on September 6, 1979 to a six story twin tower 356 bed hospital on Barrington Road just south of Higgins Road. It was so welcome to all the families, not only in Hoffman Estates but other surrounding suburbs who, like myself, had those day to day emergencies with their little ones and health issues as us parents were growing older and in need of more care for ourselves. Along with the hospital came doctors buildings and the Behavioral Health Facility. It was difficult to keep up with the hospital’s frequent name changes. It was sold to Humana Inc. and became Suburban Medical Center Hospital of Hoffman Estates, then in 1983 the name became Humana Hospital. In 1993 the name changed again to Hoffman Estates Medical Center. Columbia/HCA Healthcare Corp. purchased the hospital and the name changed once again. It was now Columbia Hoffman Estates Medical Center. This lasted for one year when it reverted back to Hoffman Estates Medical Center when there were plans to sell the hospital. In 1999 Alexian Brothers Health System purchased the hospital and changed the name to St. Alexius Hospital. With the opening of the beautiful Woman’s & Children’s Hospital in April of 2013, the St. Alexius Medical Campus is a dream come true for all of us. The photo of St. Alexius Hospital originates from the PatricksMercy Flickr account. We thank them for the use. Imagine getting out of your car at the hospital parking lot only to be greeted by a black Angus steer making its way between the cars. From time to time this would happen at the new Humana Hospital on Barrington Road in Hoffman Estates. Next door to the hospital, at Bierman Implement on Barrington Road, Jon Bierman would get the call letting him know that his Uncle George Steinmayer’s steers were out again and walking around the hospital parking lot. Given the open nature of the western part of the township, it wasn’t too surprising that you could expect such an occurrence in the early 1980s. No one minded too much because the people of Schaumburg Township were just happy to have a hospital. It had been a long time coming. 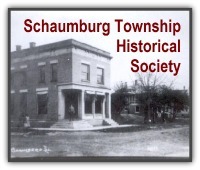 Back in 1966 the village of Schaumburg started pushing for a hospital to be built on Schaumburg Road, on various parcels of land that now house Friendship Village and the Post Office. The plans fell through and in 1974 American Medicorp, a Pennsylvania-based development firm, sought capital to build a hospital in Hoffman Estates along Barrington Road between Higgins and Golf Roads. Promises of funding came and went and hope all but dried up as the village extended the zoning deadline for another year to May 5, 1977. And indeed it did. Having purchased the 18 acres for $1 million, the hospital became known as Community Hospital of Hoffman Estates until Humana Inc. bought the hospital in the midst of construction. Architects for the project were Shayman & Salk of Chicago with Pepper Construction building the $20 million hospital. Two years later–and on schedule–Suburban Medical Center Hospital of Hoffman Estates held its dedication on August 19, 1979. Other unique elements included an emergency care concept called “Insta-Care” which focused on care first and paperwork second and a “Day-Surgery” service that allowed “more than 200 surgical procedures to be performed on a cost-saving, same-day basis. The patient will be admitted in the morning and discharged that same afternoon and evening.” All patient rooms had “a private bath and color television and each patient has an individual telephone.” A five-story, doctors’ building was also under constrution and would “house a variety of specialists, as well as doctors in both family practice and internal medicine.” [Voice, August, 1979] Within three weeks, hospital Administrator Charles Iobe was reporting that the hospital was forced to turn away ambulance crews because the beds were full. As a result, staffing levels were increased in a big hurry and it was safe to say that the hospital was obviously a local necessity. 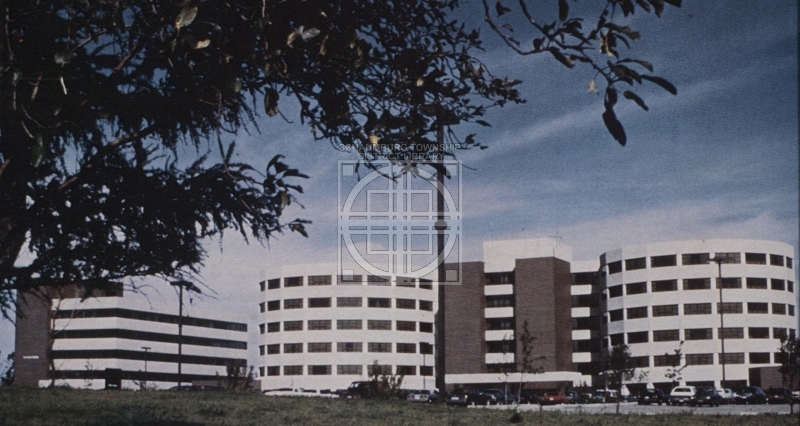 By July, 1983 the hospital changed its name to Humana Hospital, mimicing the name of its owner. Known for its strong obstetrics department, a $5.1 million expansion was in full swing by 1984 and was designed to increase space in the emergency room and provide for more out-patient service with a day surgery unit. The year 1991 also saw changes when another six-story doctors’ office building was added to the complex and a new maternity unit was planned. And, yet, another name change occurred on February 27 1993. Humana remained the owner but they took their name off of the building when they spun their hospital operation into a new company, Galen Health Care Inc which wanted to project more of a community rather than corporate connection. Hence, the name Hoffman Estates Medical Center. At the same time, the hospital announced yet another addition to provide for new testing equipment. This followed on the heals of a $5.3 million maternity wing that had been added in July 1992 and a $3.5 million intensive-care unit that would open in March 1993. 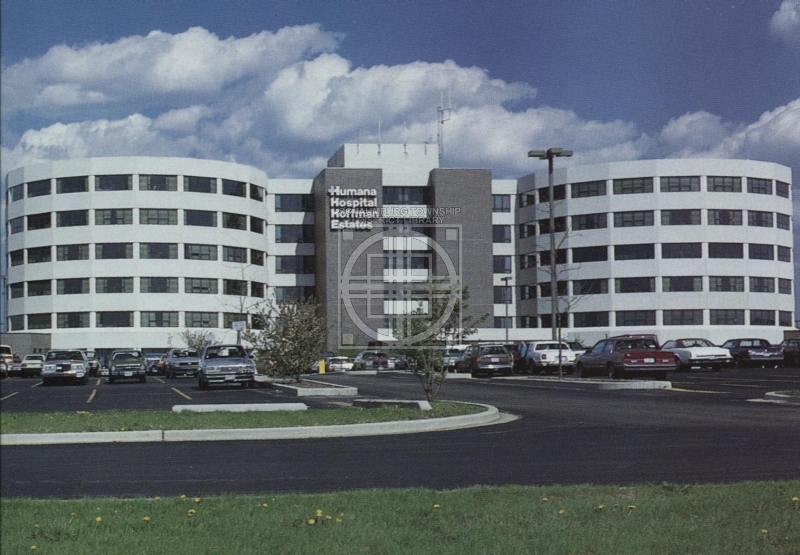 In 1994 the hospital was bought by Columbia/HCA Healthcare Corp. of Nashville for $20 million but they did not add their name to the building until 1996 when it became Columbia Hoffman Estates Medical Center. That lasted for approximately a year when “Columbia” was dropped because of their intent to sell the facility. 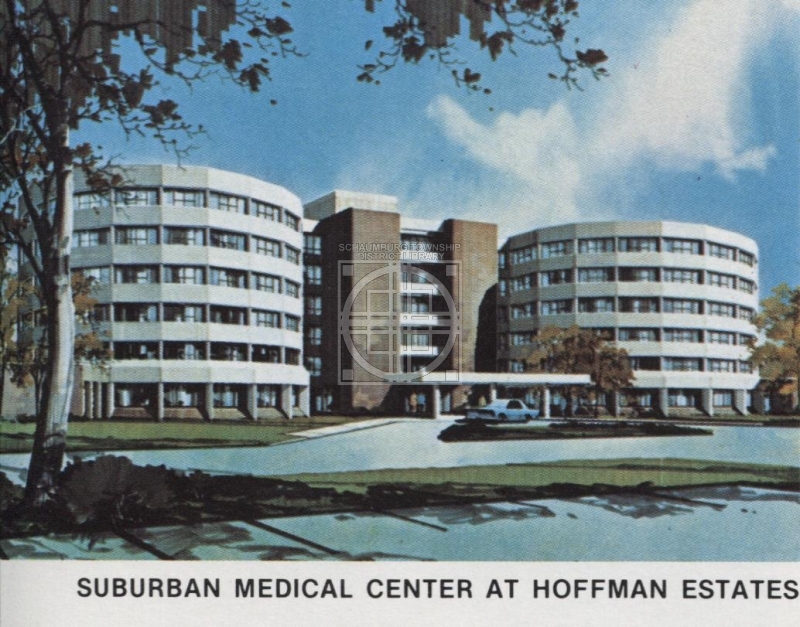 From 1997 until 1999 the hospital name reverted to Hoffman Estates Medical Center. In February 1999, the medical center acquired its sixth name. With the purchase by Alexian Brothers Health System for $270 million, the name changed to St. Alexius Medical Center. As it remains today. Since this purchase, the hospital has continued to expand with the opening of yet another doctors’ building, a parking garage and the extension of the circular drive through the medical campus. In April, 2011, it was announced that Alexian Brothers Health System would become part of Ascension Health. This merger allowed for an influx of capital to create the Women and Children’s Hospital that is scheduled to open this year. This posting was written with the assistance of various articles from the Daily Herald, Chicago Tribune and The Voice.